Please see below for a list of confirmed keynote speakers and descriptions of their talks. We have secured a favourable rate for conference guests at Grange Langham Court Hotel. Double Superior Room: £135, ex. VAT incl. English breakfast. To take advantage of this offer, please contact the hotel via reservations@grangehotels.com and quote group ID no. 200517S. Guests will settle their own account on departure. Other accommodation options include Hallam Hotel, YHA London Central, and Airbnb. An Interdisciplinary Symposium hosted by the Westminster Institute for Advanced Studies. The journal tripleC: Communication, Capitalism & Critique supports and helps organising the symposium. In this presentation I explore three ways of rethinking the human through the digital. The first is reactive; here, the use of ubiquitous data is seen to enable new methods of mapping/tracing relations in time and space. In this paradigm, problems are seen more clearly through an ontology of depth, ‘drilling down’ to context where processes/path dependencies come to light which can be intervened in. The second is responsive, the paradigm of sensing and datafication: seeing relations in real-time, to enable increasingly automated processes of governing emergence. Here, the Internet of Things and cyborg more-than-human assemblages are imagined to govern with rather than over or against potential problems or threats of climate change, disease or socio-economic crises. The goal is that of resilience: the maintenance of the status-quo or homeostatic governance. The third form of adaptation is autopoietic, less goal-directed and therefore more future-orientated, for example, hacking as a project of exploration of the possibilities of relations and processes, detaching and repurposing assemblages creating new possibilities. In all three, the ‘what-is-ness’ of the world is given its due; there are no assumptions of linear, abstract or universal frames of knowledge or governmental capacity. They could also be seen as stages through which ‘the digital’, in enabling adaptive possibilities, has facilitated the building of a home in a posthuman world. David Chandler is Professor of International Relations, Department of Politics and International Relations, University of Westminster. He edits the journal Resilience: International Policies, Practices and Discourses and has written widely on governance and intervention in the international sphere. His most recent books are Peacebuilding: The Twenty Years’ Crisis, 1997-2017 (Palgrave, 2017); The Neoliberal Subject: Resilience, Adaptation and Vulnerability (co-authored with Julian Reid) (Rowman & Littlefield, 2016); Resilience: The Governance of Complexity (Routledge, 2014). Communicative capitalism replaces the use value of political speech with its exchange value: is it interesting, timely, or outrageous enough to share? From the perspective of liberal democracy, this development looks like a disaster. From a communist perspective, this is a new opening to the force of the many. Jodi Dean is the Donald R. Harter ’39 Professor of Humanities and Social Sciences at Hobart and William Smith Colleges in Geneva, NY. She is the author of twelve books, including Blog Theory (Polity 2010), The Communist Horizon (Verso 2012), and Crowds and Party (Verso 2016). Contemporary capitalism features at the political-economic level phenomena such as crisis, authoritarianism and nationalism and at the communicative level features such as information labour, social media, big data and the international division of digital labour. 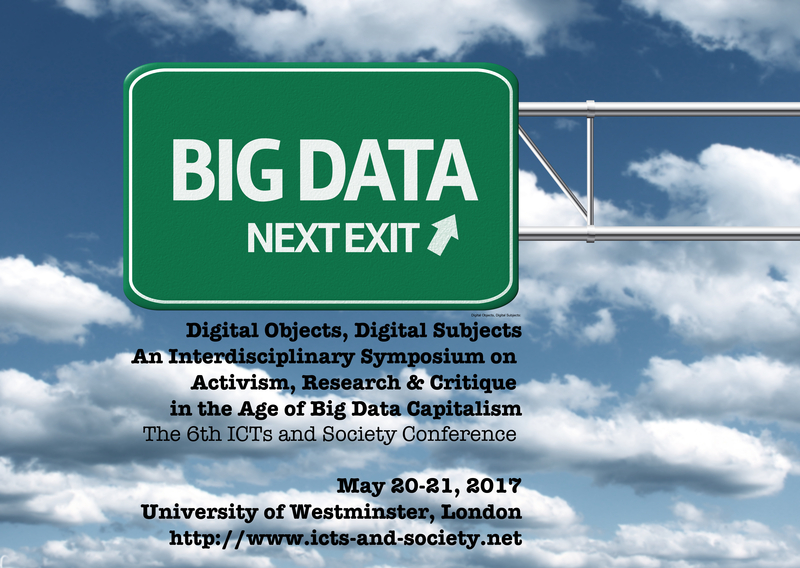 This talk focuses on the relevance of Karl Marx’s theory and Marxist theory traditions for understanding and criticising capitalism in the age of big data. First, the presentation will outline causes of the contemporary crisis of capitalism. Second, it will focus on theorising communication from a Marxian perspective. Third, elements of a critique of big data analytics’ instrumental reason will be outlined. Fourth, the talk will analyse the international division of digital labour. Fifth, the focus will be on the ideology critique of contemporary online nationalism and elements of online fascism. In times of deep crisis, Marx is an important intellectual starting point for developing practical alternatives. Christian Fuchs is a professor at the University of Westminster, where he is Director of Westminster Institute for Advanced Studies and Communication and Media Research Institute. He is a member of the European Sociological Association’s executive committee. He has published widely on critical and Marxist theory; digital media & society; media, culture & society. Christian is co-editor of the open access journal tripleC: Communication, Capitalism & Critique. Among his publications are “Critical Theory of Communication: New Readings of Lukács, Adorno, Marcuse, Honneth and Habermas in the Age of the Internet” (2016), “Reading Marx in the Information Age” (2016), “Digital Labour and Karl Marx” (2014), “Culture and Economy in the Age of Social Media” (2015), “Social Media: A Critical Introduction” (2nd edition, 2017), “OccupyMedia! The Occupy Movement and Social Media in Crisis Capitalism” (2014). In recent years we have witnessed the rise of a series of new digital parties that incorporate in their functioning a variety of forms of collaboration and organisation that typify the era of social media and apps. These include formations such as Podemos, the 5 Star Movement, and Pirate Parties. In this presentation I will argue that these parties display a common digital party-form which I describe as platform party, due to the way these parties internalise the logic of digital platforms in their functioning, both because of the use of social media and their construction of digital democracy platforms. This shift radically changes the organisational structures of political parties, with a light bureaucratic structure, but at the same time an active and militant base, which in certain respects is reminiscent of the support base of mass parties of the industrial era. This new party form is counter to the representation made by libertarians – not an horizontal space, but rather a field in which hierarchies emerge, which have much to say abou the contradictory nature of our digital society. Paolo Gerbaudo is a cultural and political theorist looking at the transformation of social movements and political parties in a digital era. He is the Director of the Centre for Digital Culture at King’s College London and the author of Tweets and the Streets: Social Media and Contemporary Activism (Pluto, 2012) and the forthcoming volume The Mask and the Flag: Populism, Citizenism and Global Protest (Hurst/OUP, 2017). Today, growing concerns with climate change, energy scarcity, security, and economic collapse have turned the focus of urban planners, investors, and governments towards “infrastructure” as a site of value production and potential salvation from a world consistently defined by catastrophes and “crisis”. From discussions about “disaster capitalism” to the embrace of a world after humans, the idea that some environmental, economic, or security catastrophe has arrived, or will arrive, is almost unquestioned. In response, there has emerged a new paradigm of high technology infrastructure development obsessed with “smart” or “ubiquitous” infrastructures. Such “smartness” must be understood as quite specific as it directly refers to computationally and digitally managed systems—from electrical grids to building management systems—that can learn, and in theory adapt, through analyzing data about themselves. Whether threatened by terrorism, sub-prime mortgages, energy shortages, or hurricanes, the response is surprisingly similar. The politics of digital labour has become a key dimension of critique in relation to big data capitalism. This refers both to the labour undertaken by paid workers and the value generation performed by consumers as they interact with each other and with platforms. However, these critiques often draw upon binary logics, typically investigating either the economic dimensions of such activity or its cultural or individual consequences. In effect, these studies have mapped on to the long-standing and unproductive schism between political economy and cultural studies/identity politics. Drawing on Marxist feminist critiques of domestic work, this paper will advocate a model that transcends these binaries. Using the figure of the Digital Housewife, who is engaged in labour that is both alienated and always potentially disalienating, this discussion will offer a critique that integrates the fiscal and cultural dimensions of digital labour. It will highlight how the importance paid to the intersection of subjectivity and economics in (Marxist) feminist paradigms offers complex tools for understanding the wide ramifications of labour in digitally mediated capitalism and, perhaps most importantly, for amplifying sites of struggle. Dr. Kylie Jarrett is Senior Lecturer in the Department of Media Studies at Maynooth University, Ireland. She is author of Feminism, Labour and Digital Media: The Digital Housewife (Routledge 2016) and co-author of Google and the Culture of Search (Routledge 2013). She has extensively researched the political economy of the commercial Web, investigating such sites as Facebook, eBay and YouTube. The Incorporation of the Digital Machine: A Metaphor? In the debate on the impact of digital technology on society, considering that digital technologies have profoundly changed the way we learn and communicate, and especially the “mode of production”, and remembering that this transformation takes place in an era of capitalist economic hegemony – the hypothesis often arises that the producer is transformed by the use of this machine. There is speculation that the user incorporates the instrumentality of the digital machine. Furthermore, when one recognizes that capitalist production develops its process of value creation by using cognitive labour power (and that this form of value production becomes more and more prominent) the technological incorporation of the cognitive cooperation of workers, seems to become ever more central to capitalist exploitation. Consequently, in the Marxist debate, people have started talking of an “appropriation of fixed capital” by the digitized worker and by the cognitive producer. Are these simply metaphors? Antonio Negri, known as “Toni” Negri (1933), is an Italian philosopher and politician. He was one of the central figures of Italian “workerist” Marxism in the 1960s. His work is devoted both to studies of political philosophy (Descartes, Hegel, Leopardi, Spinoza, Marx, the concept of “constituent power”, etc.) and, for some twenty years, the analysis of the phenomenon of globalization. Algorithmic governmentality is an immune system of the computational against the incomputable, is a powerful fiction folding the digital upon itself. In the technical ideology of big data, digital data-signals do not represent the world, they dispense of the world, they exhaust the world in all his spatial and temporal dimensions. If, as Frederic Neyrat wrote, the two evils killing societies today are the belief in immunity allowing to destroy everything on the one hand, and, on the other hand, the programmation of conducts preventing people from existing (where “existing” means being a self in excess of its actual self or a presence in becoming), algorithmic governmentality no doubt accelerates our agony. The questions is thus : how do we invent ways to intervene with(in) these new data-objects and data-spaces in ways that would favor bifurcations rather than optimization of the unsustainable state of affairs? I will argue that critique in an age of algorithmic governmentality requires the preservation and revalorization of “heterochronic” scenographies allowing enunciation, fabulation, narration of projects without predictions (rather than predictions without projects), spaces of legal, institutional and other counter-factual fabulations. Doc­tor of Laws of the Eu­ro­pean Uni­ver­si­ty In­sti­tu­te (Flo­rence), Antoinette Rouvroy is per­ma­nent re­se­arch as­so­cia­te at the Bel­gi­an Na­tio­nal Fund for Sci­en­ti­fic Re­se­arch (FNRS) and at the Re­se­arch Cent­re In­for­ma­ti­on, Law and So­cie­ty, Law Fa­cul­ty, Uni­ver­si­ty of Na­mur (Bel­gi­um). She is honorary professor of the department of philosophy of the University of Namur (teaching ‘Questions of applied ethics in data-driven societies’) She is also mem­ber of the European Data Protection Supervisor (EDPS)’s Ethical Advisory Board (EAB) and member of the French CNIL (Com­mis­si­on In­for­ma­tique et Li­bertés)’s Fo­re­sight com­mit­tee. In her published papers, she has ad­dres­sed, among other things, is­su­es of pri­va­cy, data pro­tec­tion, non-dis­cri­mi­na­ti­on, and equa­li­ty of op­por­tu­nities. Rouvroy is the author of Human Genes and Neoliberal Governance. A Foucauldian Critique, Routledge, 2008, and has co-edited (with Mireille Hildebrandt), Law, Human Agency and Autonomic Computing, Routledge, 2011. In 2016, she wrote a report commissioned by the Council of Europe « Of Data and Men: fundamental Rights and Liberties in a World of Big Data ». Her cur­rent in­ter­di­sci­pli­na­ry re­se­arch in­te­rests re­vol­ve around what she has called al­go­rith­mic go­vern­men­ta­li­ty. Un­der this fou­caul­di­an neo­lo­gism, she ex­plo­res the se­mio­tic-epis­te­mic, po­li­ti­cal, le­gal and phi­lo­so­phi­cal im­pli­ca­ti­ons of the com­pu­ta­tio­nal turn (Big Data, al­go­rith­mic pro­filing, in­dus­tri­al per­so­na­liza­t­i­on) and the role of legal systems in preserving possibilities of cri­tique, re­sis­tan­ce and re­cal­citran­ce. Taking as a point of departure the various torrential entities which constitute the contemporary megacity, the lecture will explore how residential epistemologies, externalities of scale, and ecologies of hostility program sociospatial formations. Through a survey of recent design projects from anexact office, labnet.asia, and the Urban Risk Lab at MIT, the presentation will argue for an interventive disposition toward the torrential formations which characterize the Anthropocene. Etienne Turpin is a philosopher studying, designing, curating, and writing about urban systems, knowledge infrastructures, visual and spatial cultures, and colonial-scientific histories. He is the Founding Director of anexact office in Jakarta and a Research Scientist with the Urban Risk Lab at the Massachusetts Institute of Technology, where he coordinates the Humanitarian Infrastructures Group and co-directs the PetaBencana.id disaster mapping platform. Etienne is co-editor of the intercalations: paginated exhibition series, produced as part of Das Anthropozän-Projekt at the Haus der Kulturen der Welt in Berlin. He is also the editor of Architecture in the Anthropocene (Open Humanities Press, 2013), and co-editor of Fantasies of the Library (MIT Press, 2016), Art in the Anthropocene (Open Humanities Press, 2013), and Jakarta: Architecture + Adaptation (Universitas Indonesia Press, 2013). In his new book Goodbye iSlave: A Manifesto for Digital Abolition (U of Illinois Press, 2016), Jack Qiu contends that features of enslavement have crept into the digital media industries, leading to the worsening of labor conditions along the assembly line and in the data mine, creating “a generation of iSlaves trapped in a global economic system that relies upon and studiously ignores their oppression”. How can people fight back, start a new abolition movement, using not only conventional tools of activism including body politics but also the same digital media instruments such as the smartphone? Drawing from his fieldwork in China, lessons from history, and studies of contemporary campaigns against Foxconn (the world’s largest electronics manufacturer) and Apple, Qiu shall argue that the expansion of slave systems is always accompanied by endeavors of antislavery when the exploited resist the powers that be, when citizens join the struggle to set humanity free. Although digital abolition at its present stage is still inchoate, it is undoubtedly an important first step. Its long-term implication shall not be underestimated. iSlaves have nothing to lose but their chains; they have a world to win. Jack Linchuan Qiu is professor at the School of Journalism and Communication, the Chinese University of Hong Kong, where he serves as deputy director of the C-Centre (Centre for Chinese Media and Comparative Communication Research). His publications include World’s Factory in the Information Era 信息时代的世界工厂 (Guangxi Normal University Press, 2013), Working-Class Network Society (MIT Press, 2009), Mobile Communication and Society (co-authored, MIT Press, 2006), some of which have been translated into German, French, Spanish, Italian, Portugese, and Korean. He is on the editorial boards of 12 international academic journals and is Associate Editor for Journal of Communication. He also works with grassroots NGOs and provides consultancy services for international organizations.